Jim Balhoff has written a nice image depiction plugin for Protege4. Here it is in action showing uberon’s mouth. The plugin is available from github. You can try it on the uberon depictions owl file, http://purl.obolibrary.org/obo/uberon/depictions.owl. Annotations: description "Medical illustration of a human mouth by Duncan Kenneth Winter. Part of an unpublished manuscript on medical illustration written by Winter." 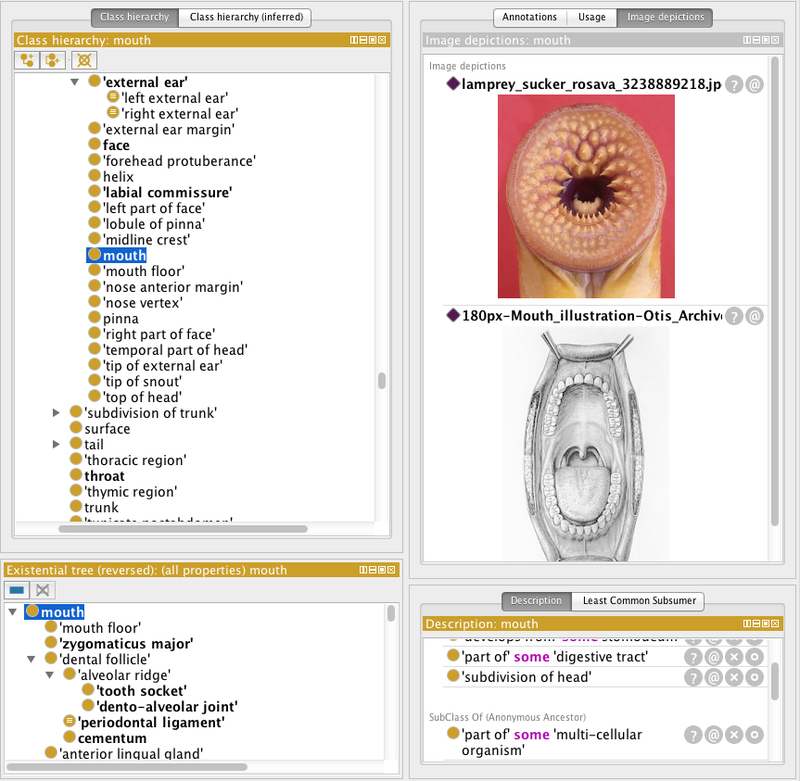 Jim’s plugin makes use of the reasoner, so these species-specific depictions would show up in the generic uberon “mouth” class (unfortunately Elk0.2 doesn’t support individuals, and a fast reasoner like Elk is required for Uberon – however, Elk0.3, due very soon, should support individuals). Many of the images in uberon were derived automatically by dbpedia SPARQL queries and may not have been verified. Whilst probably SFW, some of the depictions may be a little racy, so exercise caution whilst poking around the nether regions! The images in wikipedia are obviously human centric – it would be nice to have more sources for other animals. If anyone knows any sources that would be easy to mark up let me know.